Shōkaku (Japanese: 翔鶴 'Flying Crane') was an aircraft carrier of the Imperial Japanese Navy, the lead ship of her class. Along with her sister ship Zuikaku, she took part in several key naval battles during the Pacific War, including the attack on Attack on Pearl Harbor, the Battle of the Coral Sea and the Battle of the Santa Cruz Islands before being torpedoed and sunk by an American submarine at the Battle of the Philippine Sea. The Shōkaku class carriers were part of the same program that also included the Yamato-class battleships. No longer restricted by the provisions of the Washington Naval Treaty, which expired in December 1936, the Imperial Japanese Navy was free to incorporate all those features they deemed most desirable in an aircraft carrier, namely high speed, a long radius of action, heavy protection and a large aircraft capacity. Shōkaku was laid down at Yokosuka Dockyard on 12 December 1937, launched on 1 June 1939, and commissioned on 8 August 1941. With an efficient modern design, a displacement of about 32,000 long tons (33,000 t), and a top speed of 34 kn (63 km/h; 39 mph), Shōkaku could carry 70–80 aircraft. Her enhanced protection compared favorably to that of contemporary Allied aircraft carriers and enabled Shōkaku to survive serious battle damage during Coral Sea and Santa Cruz. In appearance, Shōkaku resembled an enlarged Hiryū, though with a 35.3 m (116 ft) longer overall length, 4.6 m (15 ft) wider beam and a larger island. As in Hiryū, the forecastle was raised to the level of the upper hangar deck to improve seakeeping. She also had a wider, more rounded and heavily flared bow which kept the flight deck dry in most sea conditions. The carrier's forefoot was of the newly developed bulbous type, sometimes referred to informally as a Taylor pear, which served to reduce the hull's underwater drag within a given range of speeds, improving both the ship's speed and endurance. Unlike the larger bulbous forefoots fitted to the battleships Yamato and Musashi, however, Shōkaku's did not protrude beyond the ship's stem. Unlike British carriers, whose aviation fuel was stored in separate cylinders or coffer-dams surrounded by seawater, all pre-war Japanese carriers had their aviation fuel tanks built integral with the ship's hull and Shōkaku was no exception. The dangers this posed, however, did not become evident until wartime experience demonstrated these were often prone to cracking and leaking as the shocks and stresses of hits or near-misses to the carrier's hull were inevitably transferred to and absorbed by the fuel tanks. Following the debacle at Midway in mid-1942, the empty air spaces around Shōkaku's aviation fuel tanks, normally pumped full of inert carbon dioxide, were instead filled with concrete in an attempt to protect them from possible damage. But this did little to prevent volatile fumes spreading to the hangar decks in the event damage did occur, particularly demonstrated when Cavalla torpedoed and sank her. Shōkaku normally stowed 150,000 gallons of AvGas for operational use. The geared turbines installed on Shōkaku were essentially the same as those on Sōryū, maximum power increasing by 8,000 shp (6,000 kW) to 160,000 shp (120,000 kW). In spite of all the additional armor, greater displacement and a 2.1 m (6.9 ft) increase in draught, Shōkaku was able to attain a speed of just over 34.2 kn (63.3 km/h; 39.4 mph) during trials. Maximum fuel bunkerage was 4100 tons, giving her a radius of action of 9,700 nmi (18,000 km; 11,200 mi) at 18 kn (33 km/h; 21 mph). Two same-sized downward-curving funnels on the ship's starboard side, just abaft the island, vented exhaust gases horizontally from the boilers and were sufficiently angled to keep the flight deck free of smoke in most wind conditions. Shōkaku's 242 m (794 ft) long wood-planked flight deck ended short of the ship's bow and, just barely, that of the stern. It was supported by four steel pillars forward of the hangar box and by two pillars aft. The flight deck and both hangars (upper and lower) were serviced by three elevators, the largest being the forward one at 13 m (43 ft) by 16 m (52 ft). All three were capable of transferring aircraft weighing up to 5,000 kg (11,000 lb) and raising or lowering them took approximately 15–20 seconds. Shōkaku's nine Type 4 electrically operated arrester wires followed the same standard arrangement as that on Hiryū, three forward and six aft. They were capable of stopping a 6,000 kg (13,000 lb) aircraft at speeds of 60–78 knots. A third crash barrier was added and a light collapsible wind-break screen was installed just forward of the island. Hangar space was not greatly increased in comparison to the Sōryū-class carriers and both Shōkaku and Zuikaku could each carry just nine more aircraft than Sōryū, giving them a normal operating capacity of seventy-two plus room for twelve in reserve. Unlike on Sōryū, the reserve aircraft did not need to be kept in a state of disassembly, however, thereby shortening the time required to make them operational. After experimenting with port-side islands on two previous carriers, Akagi and Hiryū, the IJN opted to build both Shōkaku and her sister-ship Zuikaku with starboard-side islands. In September 1942, a Type 21 air-warning radar was installed on Shōkaku's island atop the central fire control director, the first such device to be fitted on any Japanese carrier. The Type 21 had a 'mattress' antenna and the initial prototypes were light enough that no major structural modifications were necessary. Later versions, however, were bulkier and required eventual removal of the fifth fire control director in order to accommodate the larger and heavier antenna. The presence of this radar however, undoubtedly saved Shōkaku one month later at the Battle of the Santa Cruz Islands, when Shokaku was bombed by SBD-3 dive bombers from Enterprise; the early detection of the US strike planes by this radar alerted refuelling crews below deck, giving them time to drain and purge the aviation gasoline lines before they were ruptured by bomb hits, thus saving the ship from the catastrophic avgas fires/explosions that eventually caused most of the carrier sinkings in the Pacific theater. Shōkaku's primary air defense consisted of sixteen 127 mm (5.0 in) dual-purpose AA guns in twin mountings. These were sited below flight deck level on projecting sponsons with four such paired batteries on either side of the ship's hull, two forward and two aft. Four fire control directors were installed, two on the port side and two to starboard. A fifth fire control director was located atop the carrier's island and could control any or all of the heavy-caliber guns as needed. Initially, light AA defense was provided by twelve triple-mount 25 mm (0.98 in) AA guns. Further mounts were added in 1943. Shōkaku and Zuikaku formed the Japanese 5th Carrier Division, embarking their aircraft shortly before the Pearl Harbor attack. Each carrier's aircraft complement consisted of 15 Mitsubishi A6M Zero fighters, 27 Aichi D3A1 'Val' dive bombers, and 27 Nakajima B5N1 or −2 'Kate' torpedo bombers. Shōkaku and Zuikaku joined the Kido Butai ('Mobile Unit/Force', the Combined Fleet's main carrier battle group) and participated in Japan's early wartime naval offensives, including Pearl Harbor and the attack on Rabaul in January 1942. In the Indian Ocean raid of March–April 1942, aircraft from Shōkaku, along with the rest of Kido Butai, attacked Colombo, Ceylon on 5 April, sinking two ships in harbor and severely damaging support facilities. The task force also found and sank two Royal Navy heavy cruisers, (HMS Cornwall and Dorsetshire), on the same day, as well as the aircraft carrier HMS Hermes on 9 April off Batticaloa. The Fifth Carrier Division was then deployed to Truk to support Operation Mo (the planned capture of Port Moresby in New Guinea). During this operation, Shōkaku's aircraft helped sink the American aircraft carrier USS Lexington during the Battle of the Coral Sea but was herself severely damaged on 8 May 1942 by dive bombers from USS Yorktown and Lexington which scored three bomb hits: one on the carrier's port bow, one to starboard at the forward end of the flight deck and one just abaft the island. Fires broke out but were eventually contained and extinguished. The resulting damage required Shōkaku to return to Japan for major repairs. On the journey back, the carrier shipped so much water through her damaged bow she nearly capsized in heavy seas, maintaining a high rate of speed in order to avoid a cordon of American submarines out hunting for her. She arrived at Kure on 17 May 1942 and entered drydock on 16 June 1942. Repairs were completed within ten days and, a little over two weeks later on 14 July, she was formally reassigned to Striking Force, 3rd Fleet, Carrier Division 1. The time required for repairs, combined with the aircraft and aircrew losses incurred by her and Zuikaku, kept both carriers from participating in the Battle of Midway. 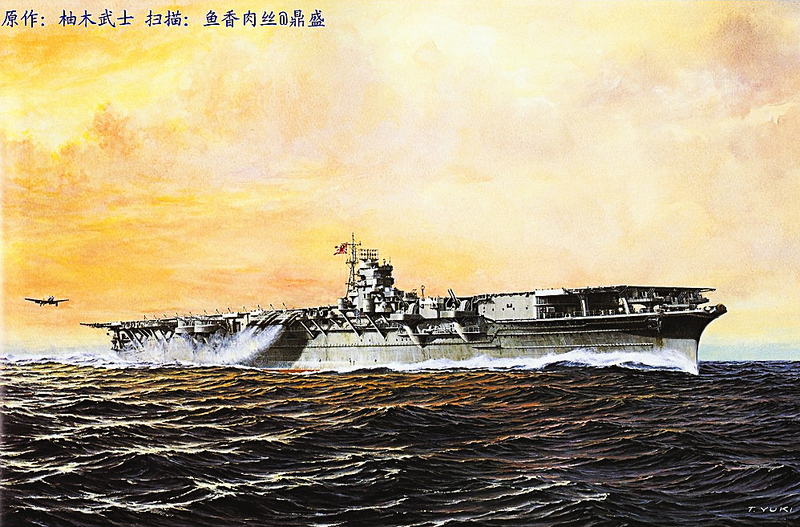 Following her return to front-line duty, both Shōkaku and her sister-ship Zuikaku, with the addition of the light carrier Zuihō, were redesignated as First Carrier Division and took part in two further battles in 1942: the Battle of the Eastern Solomons, where they damaged USS Enterprise, and the Battle of the Santa Cruz Islands, where they crippled USS Hornet (Hornet was abandoned and later sunk by Japanese destroyers Makigumo and Akigumo), but Shokaku was in turn damaged by dive-bombers of Enterprise, which therefore prevented the bombardment of nearby Henderson Field, and once again kept her out of action for months, leaving other Japanese defensive operations in the Pacific lacking sufficient airpower. At Santa Cruz, on 26 October 1942, Shōkaku was again seriously damaged, taking at least three (and possibly as many as six) 1,000-lb. bomb hits from a group of fifteen Douglas SBD-3 dive bombers launched from Hornet. With ample warning of the incoming American strike, Shōkaku's aviation fuel mains to the flight deck and hangars had been drained down and she had few aircraft on board at the time of the attack. As a result, no major fires broke out and her seaworthiness was preserved. Her flight deck and hangars, however, were left in shambles and she was unable to conduct further air operations during the remainder of the battle. After several months of repairs and training, Shōkaku, now under the command of Captain Matsubara Hiroshi, was assigned in May 1943 to a counterattack against the Aleutian Islands, but the operation was cancelled after the Allied victory at Attu. For the rest of 1943, she was based at Truk, then returned to Japan for maintenance late in the year. In 1944, Shōkaku was deployed to the Lingga Islands south of Singapore. On 15 June, she departed with the Mobile Fleet for Operation 'A-Go', a counterattack against Allied forces in the Mariana Islands. Her strike waves suffered heavy losses from US Combat Air Patrols and anti-aircraft fire, but some survived and returned safely to the carrier. One of her D4Y Suisei strike groups, composed of veterans from the Coral Sea and Santa Cruz engagements, broke through and one plane allegedly struck home with a bomb that damaged USS South Dakota (BB-57) and caused many casualties, but this group suffered heavy losses themselves. During the Battle of the Philippine Sea, she was struck at 11:22 on 19 June by three (possibly four) torpedoes from the submarine USS Cavalla (Commander Herman J. Kossler). 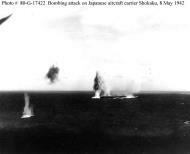 As Shōkaku had been in the process of refueling and rearming aircraft and was in an extremely vulnerable position, the torpedoes started fires that proved impossible to control. At 12:10, an aerial bomb exploded, detonating aviation fuel vapors which had spread throughout the ship. 'Abandon Ship' was ordered, but before the evacuation had progressed very far, Shōkaku abruptly took on water forward and sank quickly bow-first at position 11°40′N 137°40′E, taking 1,272 men with her. The light cruiser Yahagi and destroyers Urakaze, Wakatsuki, and Hatsuzuki rescued Captain Matsubara and 570 men. Shokaku (Japanese: Ē shkaku meaning "flying crane") was an aircraft carrier of the Imperial Japanese Navy, the lead ship of her class. Along with her sister ship Zuikaku, she is most famous for taking part in many key engagements of the World War II Pacific Theatre, including the battles of Pearl Harbor and the Coral Sea. Design: Shokaku was laid down at Yokosuka Dockyard on December 12, 1937, launched on June 1, 1939, and commissioned on August 8, 1941. The Shokaku class were part of the same program that also included Yamato-class battleships. With an efficient modern design, a displacement of about 30,000 tons, and a top speed of 34 knots (63 km/h), Shokaku could carry 70 to 80 aircraft. Her enhanced protection compared to contemporary Allied aircraft carriers enabled Shokaku to survive serious battle damage during Coral Sea and Santa Cruz, although she met her end from submarine torpedoes. Shokaku and her sister ship Zuikaku, forming the Japanese 5th Carrier Division, acquired their aircraft shortly before the Pearl Harbor attack and were ready just in time for it. Her aircraft complement consisted of 15 Mitsubishi A6M fighters, 27 Aichi D3A dive bombers, and 27 Nakajima B5N torpedo bombers. WWII service: With Zuikaku, Shokaku joined the Kido Butai (Pearl Harbor attack force) and participated in Japan's series of early wartime naval offensives, including an attack on Rabaul in January 1942, and the Battle of the Coral Sea in May. In the Indian Ocean raid of March 1942, she joined the aircraft carriers Akagi, Zuikaku, Sry, and Hiry in raiding Colombo. There Admiral Chuichi Nagumo succeeded in extensively damaging support facilities. That task completed, the task force found and sank the British carrier Hermes, and two cruisers (Cornwall and Dorsetshire), prior to moving on to the Coral Sea. Here she helped to sink USS Lexington, but was herself severely damaged by USS Yorktown's aircraft in return. After repairs, Shokaku took part in two further 1942 battles, both in concert with her sister: the battle of the Eastern Solomons, where they damaged USS Enterprise, and the battle of the Santa Cruz Islands, where they sank USS Hornet but Shokaku was once again seriously damaged by dive bombers. In 1943 under the command of Captain Matsubara Hiroshi, she resumed her role as one of the Japanese Navy's most important fleet carriers. She was assigned to a counter-attack against the Aleutian Islands, but the operation was cancelled after the Allied victory at Attu. For the remainder of 1943 she was based at Truk. Fate: In 1944 she was based at Lingga near Singapore. On 15 June 1944 she departed with the Mobile Fleet for Operation A-Go, a counterattack against allied forces in the Mariana Islands. During the Battle of the Philippine Sea on 19 June 1944 she was hit at 11:23 by three (possibly four) torpedoes from the U.S. submarine Cavalla (Commander Herman J. Kossler). As Shokaku had been in the process of refueling aircraft and was in an extremely vulnerable position, the torpedoes started fires that proved impossible to control. At 14:08 an aerial bomb exploded, detonating aviation fuel. 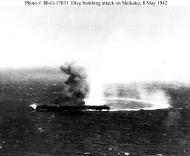 Shokaku sank quickly at position 1140N, 13740E, killing 1,272 men. The Yahagi, Urakaze, Wakatsuki, and Hatsuzuki rescued Captain Matsubara and 570 men. Completed on August 8, 1941 Shokaku displaced 32,105 tons fully loaded and had a maximum speed of 34.2 knots. Her normal complement of aircraft during operations was 72 while her crew totaled 1,660 officers and enlisted men. Her operational career began when she launched two air strikes on Pearl Harbor on December 7, 1941. On May 8, 1942 Shokaku experienced her first close shave when she was severely damaged by three bomb hits from planes of the carrier USS Yorktown during the Battle of the Coral Sea. Though burning, she conducted evasive maneuvers and all enemy torpedo attacks missed. Casualties were 108 officers and men killed by the fires and explosions, with 40 wounded. During her subsequent race for home she avoided eight submarines. However, she nearly capsized due to flooding via bomb damage in her bow. Following repairs, Shokaku returned to service during the Battle of the Eastern Solomons where she suffered light damage from bomb fragments. On October 26, 1942 Shokaku was again heavily damaged by bombs during the Battle of Santa Cruz. As many as six struck her, and started large fires leaving the flight deck buckled amidships. Fortunately, none of her aircraft were aboard. Because aircraft fuel and munitions were secured, damage control efforts were able to save the ship. She retired to Truk for emergency repairs and then continued on to Yokosuka for refit. As one of two remaining carriers from the Pearl Harbor strike, Shokaku returned to operations in the summer of 1943 and served repeatedly through the ensuing year. In June 1944 Shokaku embarked with Operation A-Go to counter-attack allied operations in the Marianas. On the 15th she was spotted by the U.S. submarine Cavalla steaming towards the Philippine Sea. Rather than attack, Cavalla got off a detailed contact report regarding the Japanese forces. 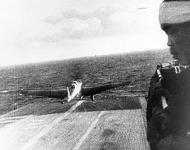 As Shokaku steamed away, Cavallafs skipper, Herman Kossler, assumed he had lost his chance at the carrier. This would prove not to be the case. Over the next four days Cavalla was redeployed to a new patrol area as a result of the contact report she had submitted. On the 19th, Cavalla picked up another large enemy contact. Periscope observation confirmed a large carrier with several escorts. Kossler had found Shokaku a second time. Shortly after 1100 Cavalla fired a spread of six torpedoes. At least three, possibly four, struck Shokaku and ignited large fuel fires. Shokakufs initial list was corrected through counterflooding. However, fires soon detonated an aerial bomb causing further damage. Her boilers shut down shortly thereafter. At 1350 the order was passed to abandon ship. Ten minutes later Shokaku sank bow first. Four violent explosions shook the vessel immediately thereafter claiming many of her crew. A total of 1,272 were lost. In the Battle of the Philippine Sea (called the Battle for the Marianas by the Japanese), the Imperial Japanese Navy lost three aircraft carriers within a period of thirty-six hours. These were the Taiho, Shokaku, and Hiyo. All three were victims of the same fateful combination of torpedo damage that set up massive vapor-induced explosions. Adequate reports exist for the Taiho and, to a lesser degree, for the Hiyo's loss. This analysis concerns itself with the third carrier mentioned, the veteran and famous Shokaku, torpedoed and sunk by U.S.S. Cavalla (SS-244) on 19 June 1944. The Shokaku was indeed a famous ship, and battle-scarred as well. Her illustrious record included such battles as the attack on Pearl Harbor, the Indian Ocean sorties, the Battle of Coral Sea, and the naval battles around Guadalcanal. With sister-ship Zuikaku as part of CarDiv 5, the Shokaku had participated in nearly every carrier battle except Midway. Indeed, some historians cite the absence of the Shokaku and Zuikaku -- recovering from Coral Sea damage or losses -- as the deciding factor in the Japanese defeat at Midway. Whether that is true or not, there was no denying that Shokaku's record and crew were both of the highest standing. It was natural, then, that she and her sister should be teamed with the grand new carrier Taiho when Admiral Ozawa set forth to challenge the U.S. invasion of Saipan in June 1944. It was widely hoped that the unprecedented combination of Imperial sea and land-based air forces would turn the tide at the Battle of the Philippine Sea, but it was not to be. Taiho would perish from complications arising from a single torpedo hit, and Shokaku herself would be sunk this selfsame day by the same agent -- U.S. submarines. Yet that sinking is veiled by a remarkable reticence of detail -- a frustrating brevity of story that forms an unsatisfactory end to such a brilliant career. "Shokaku (CV-6) - Shokaku Class. Sunk 19 June 1944 during the Battle of the Philippine Sea. 1100 (approx.) She was west of the Marianas when struck by not more than three submarine torpedoes. One was close to the forward bomb magazines. Gasoline tanks were ruptured, and there was a fire of undetermined proportions. The fire was extinguished promptly, according to survivors, by closing all access to the spaces surrounding the gasoline tanks. Gasoline fumes, however, began to seep throughout the ship. Several hours later an enormous explosion caused her to disintegrate. It may have been her bomb magazines." While the preceeding reference may have been influenced by the American point of view, "The Campaigns of the Pacific War" includes faithful translations of Japanese source documents. But except for track position coordinates that conflict from one report to another, the only added information is a repeated assertion that Shokaku was hit by four torpedoes. This presents a definite discrepency between American accounts and the meager surviving details from the Japanese point of view. In 1952, less than ten years after these reports were written, Fukaya Hajime wrote an article on the Shokaku-class vessels for U.S. Naval Institute Proceedings. Though his account of the sinking is brief, it adds a remarkable additional detail as given from the Japanese side. Fukaya writes that, after the torpedoes hit Shokaku, "damage to the carrier, already severe, was compounded by the outbreak of fires which soon enveloped the entire ship. The situation soon became hopeless as the ship settled rapidly by the bow. Water quickly reached the flight deck and spilled through the open Number 1 elevator into the hanger. Thus stricken the Shokaku lost stability, turned over, and sank". With the exception of a few other scant notes, these three sources form the core of nearly every account of the Shokaku's sinking published in English to date, from Normal Polmar's brilliant "Aircraft Carriers" and John Toland's "Rising Sun" to the more modern "Red Sun Setting" of W.T. Youngblood. Though modern Japanese sources or memoirs were hoped to exist, the primary source quotes above represented the sum total discovered by the authors prior to this analysis of Shokaku's loss. Such sparseness of detail, for so great a ship, seemed a gap in the historical record. Since the action capsule did give one vital clue regarding the location of one of the torpedo hits, the authors were challenged to seize upon that fact to reconstruct the sinking mathematically, as has been done with such noted success recently with RMS Titanic. Though such a reconstruction could only be speculation, the temptation to try was spurred by the fact that - in contrast to the IJN records - the U.S. side was amply covered. Cavalla's full attack report includes the firing angles and sequences of the torpedoes launched. Armed with this, we resolved to match the Cavalla's attack figures to the one fixed point - the hit near the for'd bomb magazines - and proceed from there, bearing in mind the historical conditions that had to be satisfied. What began as an analytical exercise evolved into the present article when a modern Japanese source account was found, and contributed important and unique details. Given their value, it was decided to publish the study. The analysis that follows, while necessarily speculative, did exhibit striking correlation to the new information discovered. The work is in two parts: (A) The reconstruction analysis, and (B) the historical narrative. Although the analysis itself cannot be asserted as factual, since the sources remain reticent on the question of the impact points, it seemed useful to present it here. At 1100 19 June 1944 the three crack carriers Taiho, Zuikaku, and Shokaku were steaming proudly in formation, having launched air strikes against the U.S. carrier fleet covering the invasion of the Marianas. The trio formed a spearhead, with Zuikaku in the lead, and the Taiho and Shokaku on the port and starboard quarters of the formation respectively. This was the titanic Battle of the Philippine Sea, and at an hour before noon that day the Japanese carrier fleet had not even been found by search planes, and had already launched two strikes against their foe. The portents could hardly have been more favorable. 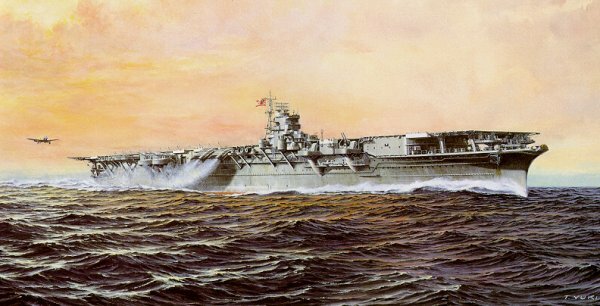 Yet within five hours, two of these carriers would be demolished and the scales of battle irrevocably tipped against the Japanese. It had begun at 0810, when the USS Albacore had slammed a fateful single torpedo hit into Ozawa's proud flagship, Taiho. The Taiho had shrugged off the damage, but fumes were gathering below decks that would eventually reach a fatal concentration. Meanwhile, nearly three hours after this strike, a second U.S. submarine struck. She was the USS Cavalla. She had come in on the southern flank of the Japanese fleet and at 1048 had sighted the Shokaku in the process of landing a recon patrol. Excitedly the Cavalla's skipper, Lt. Comdr. Herman Kossler, had watched as the big Japanese carrier steamed a steady course into the southeast wind, raising large bow waves. The destroyer Urakaze steamed languidly alongside to starboard, seemingly oblivious to the submarine's presence, while two cruisers (identified by Cavalla at the time as Atago-class) were ahead off the carrier's port bow. (Actually this was light cruiser Yahagi and probably heavy cruiser Haguro.) It was nearly a perfect setup. At 1118, after only having to raise periscope three times, and at a range of 1,200 yards the Cavalla unleashed a salvo of six torpedoes at the Shokaku's starboard side . . .
First, it details exactly the bearings of all six torpedoes fired, and their firing sequence. Second, it details Cavalla's and Shokaku's course and speed. Third, it provides fairly exact timings of torpedo impacts against Shokaku. A rather complex torpedo launch sequence, wherein the torpedo is being launched at a slower speed, accelerating, and turning to the correct bearing, all within the first six to eight seconds after launch. Once the geometry of the torpedo spread was created, the next step was to reconstruct the motion of Shokaku. This was trickier to do, since we knew very little about her relative position and movements other than her course and speed. The only way to solve this dilemma was to place Shokaku's position relative to a torpedo that hit her, and then work from there. We know she was hit by torpedo #1 at T=50 seconds. Furthermore, Cavalla's log claims that probably the first three torpedoes hit Shokaku, with hits occurring at 8 second intervals. Lastly, Japanese accounts indicate that at least one torpedo struck in the forward aviation gasoline storage tanks. The results of this approach were intriguing, to say the least, and we discuss each of the three resulting hit scenarios below. In scenario #1, it is assumed that it is torpedo #1 that strikes Shokaku's avgas, at T=50 seconds. This scenario also produces a hit by torpedo #2 at T=57 seconds which impacts Shokaku almost directly on the bulkhead dividing Boiler Rooms #3 and #5. Torpedo #3 then hits at the forward end of the bridge. Torpedo #4 misses astern by about 130 feet. Torpedo #5 hits some 60 feet behind the bow. Torpedo #6 misses astern by nearly 300 feet. Analysis: This scenario produces four hits in the forward half of the ship, and causes heavy flooding. Torpedo #1 causes the requisite damage to the avgas storage and starts fires. Torpedo #2 would most likely flood two of Shokaku's eight boiler rooms, and might stop Shokaku's machinery as well (there are several instances of large Japanese warships having their propulsion systems incapacitated by a single torpedo hit). Torpedo #3 hits on or near the forward magazines and torpedo storage area, and likely contributes to the damage already sustained near the avgas storage. After this third hit, Shokaku may have had as much as one hundred sixty feet of her starboard length flooded, including a number of large machinery spaces. This would have undoubtedly caused a starboard list. In the midst of this chaos, Torpedo #5 then hits home well forward, possibly blowing a hole through both sides of the bow (which is no more than 15-20 feet in breadth in this region. This hit would cause still more flooding and would contribute to the bow trim (mentioned in some Japanese sources) by virtue of the relatively larger flooding moment that such a hit in the extremities would produce. The overall damage profile is one of extensive flooding forward, serious fires, an imminent danger to the forward magazines themselves, and heavy damage to the boiler rooms. In scenario #2, torpedo #2 is presumed to strike the avgas at T=57 seconds. By backtracking to T=50, we find that torpedo #1 hits the extreme end of the bow. Torpedo #3 hits about 60 feet further aft of Torpedo #1. Torpedo #4 hits almost directly on the rudder. Torpedo #5 misses ahead by more than 130 feet. Torpedo #6 misses astern by about 90 feet. Analysis: Scenario #2 produces a damage profile which puts three hits in the bow of the ship, and one hit in the stern. The two bow hits at the extreme stem would likely produce the bow trim mentioned in the Japanese record. The hit in the avgas (by default) produces fires. However, the hit in the rudder area is not mentioned in any of the Japanese accounts. The failure to note a hit in this region is extremely unlikely, given both the critical nature of this space to the ship's operations, and the large separation between it and the hits forward (which would have made it even more noticeable). Scenario #3 produces three hits against the ship. Torpedo #1 strikes forward, near the rearmost bow trim tank. Torpedo #2 hits Boiler Room #1 directly. Torpedo #3 hits the avgas. Torpedo #4 misses astern by about 70 feet. Torpedo #5 just barely misses the bow by a matter of a few feet, (although the overhang of the stem makes this distance even larger and almost ensures a miss). Torpedo #6 misses astern by more than 200 feet. Analysis: This third scenario produces a damage profile similar, but not as severe, as Scenario #1. A bow trim is again likely as a result of the damage, and some machinery damage is in evidence as well, with Boiler Room #1 being flooded and damage to the forward generator (which was just forward of the forward pair of boiler rooms) likely. The hit in the extreme bow contributes to the bow trim. Beyond the matrix presented above, each of the scenarios has its strengths and (in some cases) weaknesses. Scenario #2 is clearly the weakest of the three, as it is hampered by its inclusion of a hit on the rudder, which is at odds with the historical record by its omission. It also produces no direct damage to the machinery of the ship. The fact that Shokaku ground to a halt relatively close by Cavalla is a clear indication that her machinery was rendered inoperable relatively quickly. The fastest way to accomplish this is through direct damage to either the boilers or the engine rooms, neither of which is supported by this scenario. Scenario #3, while matching the letter of the base criteria, begins to look less promising on closer inspection. It produces only three hits, and an examination of the hits reveals that only #3 (the hit in the avgas) can really be considered serious, although the hit on the forward boiler room could be more serious if it also damaged the generator spaces immediately forward (which is a distinct possibility). However, the overall impression one gets is of a ship that is only moderately damaged. 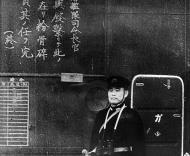 The Japanese record suggests a far more devastating set of circumstances. Scenario #1 produces just such a situation. The four hits are spaced all along the bow and manage to hit just about everything of value there, including the avgas, magazines, and machinery spaces. Torpedo #3, in particular, strikes a particularly vital point in the carrier and acts as a damage multiplier for torpedoes #1 and #2 because it threatens both machinery (in this case the electrical generating equipment immediately forward of the boiler rooms) as well as the avgas and magazines. This hit would likely complicate damage control efforts in both of the earlier hit locales. Not only that, but many of the spaces hit under this scenario (boiler rooms and magazines) are relatively large (and tall), meaning that flooding would be more severe and produce larger potential lists. As a result, Shokaku probably loses two boiler rooms instantly, and has further fires burning forward of the engine spaces. The final hit in the bow is well placed to destroy the navigability of the vessel and also exacerbate the bow trim by virtue of its placement on the extreme end of the ship. The net result is a damage profile of unusual severity. An additional point in the historic record also supports this scenario. One Japanese source mentions specifically that the initial hit sent a combination of water and burning substances in a spray across the front of the bridge, killing several aviators there. This description strongly indicates that it was the initial hit that impacted the aviation gasoline stores. All in all, in the authors' estimation, this scenario fits the historical record almost perfectly. Our analysis was subject to a number of sources of potential error. We discuss these sources, and their likely impact below. The course tracks for Cavalla, Shokaku, and the torpedoes may be in error. This is a possibility; however, Cavalla's logs seem fairly detailed with regards to obtaining an accurate course and speed for the target. In order to produce a valid target solution, Cavalla had to generate accurate course tracks for Shokaku. The nature of this attack seems to be an orderly one - Cavalla was able to launch a well thought-out spread at the target, rather than simply loosing a volley in desperation as she dove deep. The timing of the initial hit on Cavalla at T=50 seconds may be in error. At the speed the torpedo spread was travelling, and given the angles of the spread, any discrepancy here would necessarily introduce a large error in the impact points of the torpedoes. Our response to this mainly rests on the timing of the impacts produced by the mathematical model we built. In this model, when we fed course data of the two ships, as well as firing data, we got back impact times which match the 8-second separation of the historical record very closely (within a second). The torpedoes may not run true, or may run faster or slower than rated. After discussing this possibility with Dr. Frederick Milford, a noted expert on WWII torpedo technology, we discounted this risk factor. By this point in the war, American torpedoes had generally worked out the teething problems that had plagued them earlier in the war. Dr. Milford's opinion was that the torpedoes would most likely "perform as advertised", and would therefore strike very close to their predicted impact points. The Mk 23 torpedo's "wander" (the amount of lateral inaccuracy over the range traveled) at a range of 1,200-1,500 yards would most likely be a matter of a few feet, not yards. The forward aviation gasoline storage area itself is a fairly large target, leading to corresponding uncertainty as to the precise point of impact in this area. This, in turn, affects the accuracy of the other hits as well. Shokaku's forward aviation fuel tanks cover approximately 40 feet of her length. A hit anywhere in this region, or even fairly near it, would produce the fires mentioned in the historical record. As a result, an error of plus or minus 25 feet is probably not a bad margin of error to apply to the predicted hit locations of the other torpedoes as well. Obviously, this has potentially important implications. To try and make this potential source of inaccuracy more apparent, we have intentionally chosen to size our "torpedo hit" icons such that they take up an area roughly equal to this margin of error. Shokaku's starboard evasive maneuver, while insufficient to avoid the first three torpedoes, may have caused later torpedoes to miss. Furthermore, if Shokaku's machinery was damaged immediately by the initial hits, she may have slowed enough to cause later torpedoes to miss ahead. This applies mostly to Scenarios #1 and #2, which predict Shokaku taking hits in the extreme bow. In the authors' opinions, the possibility that later hits may have been affected by Shokaku's maneuvers cannot be discounted. However, it also cannot be modeled with any degree of accuracy. Given the relative 'cleaness' of the model we had managed to build, we decided not to tamper with it on the basis of the very speculative evidence at hand regarding Shokaku's despairing efforts at evasion. The turning and/or slowing of the ship does potentially produce one fewer hits on the ship, if it actually occurred. Without better evidence that it did occurr, we chose not to modify the fundamentals of the model. In the foregoing analysis we attempted to locate the likely impact points as indicated by the best evidence, but bear in mind the results must be regarded as hypothetical. However, the description of the aftermath and sinking that follows belongs to the realm of reported fact, and relates details of Shokaku's last hours beleived to be previously unpublished in English. At 1120 the Shokaku's watch was preoccupied scanning the skies for enemy aircraft, and were later judged to not have been as mindful of danger from below as they should have been. Thus when the lookout sighted torpedoes bearing 60 degrees off the starboard bow and gave warning, the tracks were already very close and it was too late. Though Captain Matsubara ordered evasive action, the situation was beyond redemption. Three, possibly four, torpedoes (survivors disagree) struck the ship at eight second intervals. The torpedo hits, whether three or four, were devastating, but not immediately fatal. Hits were recorded concentrated on the starboard side forward and amidships. One torpedo hit under and forward of the island, shattering and igniting an av-gas main that sent a fireball and burning spray bursting upwards in front of the bridge, burning and injuring several aviators relaxing before the island. Immediately some of the just-landed and fueling aircraft in the hangar exploded into flames, and the pressure of the detonation lifted the elevators 90 centimeters (nearly three feet). The wrecked lifts fell back into the wells, dumping hapless mechanics who had been standing on the forward lift into the inferno. Shokaku had just recovered planes and was fueling others when the torpedoes struck; thus highly volatile av-gas was flowing through pipes in the vicinity of the impacts. Nothing could have been as catastrophic in timing. As many as nine aircraft were in the hangar, and the hangar was turned into chaos by the shocks. Gas spewed from ruptured aircraft tanks and caught fire, and ammunition on hoists began to explode, turning the hangar into a blast furnace. Exploding bombs and aircraft fuel tanks added to the conflagration and cut down men trying to fight the fire, so that pieces of "dismembered bodies lay everywhere about the deck". With boiler rooms on the starboard side flooding quickly, the Shokaku at once lost speed, fell out of formation, and began to list rapidly to starboard. Reacting quickly, Captain Matsubara ordered port spaces counterflooded to correct the list. This was done, but too well, as damage control efforts overcompensated, and Shokaku flopped over into an opposite heel to port! (It should be noted that the magnitude of counterflooding necessary to accomplish this reverse heel to port most likely would have involved flooding of port-side machinery spaces, further complicating Shokaku's power situation.) At the same time the carrier was beginning to trim noticeably by the bow, for one of the torpedoes there had opened a large hole. 9Our analysis revealed just such a hit and raised the distinct possibility that the bow was rent clean through, which could explain the marked head trim reported throughout). The upshot was that before noon the Shokaku had become unnavigable and gone dead in the water, fires raging. In the interim, the fire in the hangar had become an inferno, for all electric circuits had failed immediately following the hits. One of the torpedoes had struck close to the forward bomb magazines and apparently this had knocked out the generator and switchboard located in this very area. (Once again, the historical record gives striking confirmation of our reconstruction, which shows just such a hit). When power failed it was impossible to power the pumps. The blaze made it impossible to reach or man the armored control booths for the fire mains in the hangar and thus there was no effective means to contain the mounting conflagration. In desperation the veteran damage control teams broke out portable extinguishers and even formed bucket brigades. However, such measures could hardly prevail against the flames, and the burning gasoline spewing from shattered pipes that "came down like burning rain on their heads". The ship was in extreme jeopardy. Nonetheless, Shokaku's damage control was among the most experienced in Kido Butai, experience born of hard-trials, when they had saved Shokaku twice---first at the Battle of the Coral Sea, and then at Santa Cruz. Those lessons now came into play and by early afternoon there seemed cause for hope. Though the fire in the hangar still raged, those in the gas tanks had been extinguished by closing off all access in the surrounding spaces. There were not too many aircraft aboard, and there was a chance the fuel fires in the hangars could be doused if they could just be contained. The inadvertent list to port remained moderate, and helped balance the rising water in the starboard side. However, the pumps were not operable and the bow continued to settle. If power could be restored, there might be hope, but this seemed unlikely. Not only that, but the deadly and highly flammable vapor from the unrefined Tarakan fuel oil (now being widely used in extremis aboard Japanese warships as Japanese refineries had run dry due to shipping losses) and the ruptured gas tanks had begun to spread through the ship. The enclosed hangar had poor ventilation in the best of conditions, and many of the ventilators were now destroyed. Thus, even though damage control had made progress in isolating the main outbreaks of fire to forward and amidships, their efforts were nullified as leaking gas and ammunition periodically exploded. In the meantime, the Shokaku's attacker had been weathering a rather ferocious depth charge attack from Lt. Comdr. Yokota Yasuteru's Urakaze. The first salvo of four exploded at the same time as Kossler's fourth torpedo, close and to port of the sub. Subsequently over the next three hours, the Cavalla counted 106 depth charges, 56 of which "were fairly close". The shocks started flooding in the hull induction and ventilation supply piping outboard, the QB and JK-C supersonice gear burned out, and all sound but JP disabled. But this damage was moderate, and by 1330 the depth charges began to slacken. Moreover, JP sound gear began to report "loud water noises" from the target. Evidently something was happening to the carrier. Indeed it was. By 1330 the fires on Shokaku were growing much worse and flames began spouting from the flight deck and elevator wells and could be seen from the other ships. Moreover, the bow continued to subside into the sea, and the situation soon became hopeless as the forecastle came awash. Reluctantly Captain Matsubara bowed to the inevitable and gave word that all hands should come up on deck, and prepare to abandon ship. Thorough check was to be made that no one remained below to perish. Officers groped their way through burning and smoke-filled compartments, calling out names and looking for any one left behind. Several hundreds of the ship's company now gathered on the flight deck aft, where the fire had not yet reached, and assembled for roll call. Others energetically threw wreckage and rafts overboard to men who had been blown into the water, or leaped into the sea and swam to the floats themselves. On the flight deck aft, the men waited in supernatural calm as the chiefs and officers made their head count, even though explosions continued to rock the ship and the flight deck was now starting to slant perceptibly downwards. In fact, at that very moment the seas were swallowing the forecastle and rising up to the level of the flight deck itself. As the bow settled, wreckage and bombs and burning planes in the hangar began to slide and bump forward. It was then that total catastrophe, even greater than that already in progress, struck. Either it was touched off by one of the fires, or was set off by tumbling as the ship nosed forward, but at 1408 an aerial bomb on the hangar deck forward exploded. Immediately the volatile gases that had been accumulating below were ignited, and the Shokaku was rent by an ominous grumble deep down inside. This was followed by a truly devastating cacophony of "four terrific explosions" followed by several smaller ones as the forward bomb and torpedo magazines were touched off. In a prolonged convulsion of three minutes the Shokaku literally began to blow apart at the seams. The men gathered aft were caught completely off-guard--they had assumed they had several minutes to evacuate; in reality they now had only seconds. They were sent tumbling and sliding down the flight deck as Shokaku's shattered bow plunged under the waves. Water surged over and across the flight deck and poured in a torrent through the open No.1 elevator into the hangar. The inrush yanked the stricken carrier downward, causing her fantail to rear terrifyingly and suddenly into the sky. The stunned Yahagi and Urakaze wasted little time in dashing forward among the mass of wreckage to the rescue. The sea was fairly calm, but the suddenness of the catastrophe precluded most chances for escape. The loss of life was appalling: fully 887 petty officers and men, and 376 men of Air Group 601; a total of 1,263 souls in all, had perished. Among the dead were some of the last of Kido Butai's great veterans, including Shokaku's Air Officer, Mitsueo Matsuda, the man who had led the bombing raids that subdued Wake Island. The death toll was keenly felt, for it was the worst to date for Kido Butai, having surpassed even the much-mourned loss of Kaga at Midway. However, by some miracle Captain Matsubara Hiroshi was among the 570 fortunate survivors rescued by light cruiser Yahagi and destroyer Urakaze. As the rescuers worked, small squalls gathered about, as if "adding their tears". In contrast to the human, the aircraft toll was small---only nine planes were listed by Mobile Fleet as having gone down with Shokaku. With the sinking of Shokaku, only her sister-carrier remained of the once proud Kido Butai that had attacked Pearl Harbor. As for Shokaku's nemesis, the erstwhile Cavalla had started planing back up to periscope depth at 1352. By now the depth charges had almost stopped. Kossler suspected it was because the escorts had more to think about, for a "loud disturbance" could still "be heard by JP in direction of attack". But no one was prepared for the "four terrific explosions" heard thundering from the target's vicinity from 1408 to 1411. Their rumblings continued for many seconds, and Cavalla's company realized they were not depth charges or bombs, but explosions on the target. Anxious now to determine the situation, Cavalla reached periscope depth at 1421. However, to Kossler's surprise, nothing was in sight. Though admitting "visibility poor due to rain squalls all around", the sub's skipper was elated---he suspected the truth: the detonations had been the death rattle of their target carrier. He said as much to ComSubPac, when - after surfacing at 1851 and running out of the battle area - when he transmitted his attack report at 2125 and added, "believe that baby sank". Though a skeptical Spruance was to spend some anxious hours trying to find and destroy the "damaged Zuikaku " reported torpedoed, ComSubPac concurred with Kossler and credited the Cavalla with sinking a Shokaku-class carrier and subsequently bestowed the Combat Insignia Award for the feat. After losing the carrier Hiyo and suffering more damage in the TF 58 air attack of 20 June, the defeated Mobile Fleet returned to the homeland, anchoring at Nakagasuku Bay, Okinawa on the afternoon of the 22nd. There, survivors of Taiho and Hiyo were transferred to Shokaku's sister carrier Zuikaku. Probably for reasons of space, but perhaps to spare them the disorientation of being aboard a "ghost" of their lost vessel, the Shokaku's survivors were transferred instead to heavy cruiser Maya; upon which they returned home on 24 June. After the loss of his ship, Captain Matsubara Hiroshi returned to Japan and on 30 June was assigned to the Yokosuka Naval District. Shortly after he was transferred to Sasebo as commander of the Naval Barracks, and subsequently finished out the year as an Instructor at the torpedo school. After sinking Shokaku, the rest of Cavalla's voyage was anti-climatic. Though she remained on patrol till ordered home on 25 July, she sank only a sampan. On 3 August 1944 she returned to Majuro, tying up at 1514 to U.S.S. Bushnell, ending a singularly brilliant First Patrol. The Cavalla went on to garner a sterling record, and was still under Kossler's command when she sank the super-destroyer Shimotsuki in November, taking down ComDesRon 31 with her. After the war, the Cavalla was retained in service after a refit. Once decommissioned, she was not scrapped, but instead has been preserved at Galveston, Texas, where she can be Visited and Seen today! Note: One source gives the Shokaku's casualties as 1,272 lost, but since the figure above is precisely broken down it was accepted. 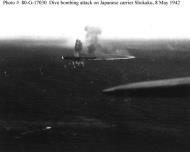 Photo #: 80-G-17027 Battle of Coral Sea, May 1942 Japanese aircraft carrier Shokaku under attack by planes from USS Yorktown (CV-5) in the morning of 8 May 1942. Splashes from dive bombers' near misses are visible off the ship's starboard side as she makes a sharp turn to the right. Official U.S. Navy Photograph, now in the collections of the National Archives. Photo #: 80-G-17030 Battle of Coral Sea, May 1942 Japanese aircraft carrier Shokaku attacked by USS Yorktown (CV-5) planes, during the morning of 8 May 1942. Flames from a bomb hit on her forecastle are visible, as are smoke and splashes from dive bombers' near misses off her starboard side. Photographed from a Torpedo Squadron Five TBD-1. What appear to be erratic torpedo tracks are visible in the lower left. Official U.S. Navy Photograph, now in the collections of the National Archives. Photo #: 80-G-17031 Battle of Coral Sea, May 1942 Japanese aircraft carrier Shokaku under attack by USS Yorktown (CV-5) planes, during the morning of 8 May 1942. Flames are visible from a bomb hit on her forecastle. Official U.S. Navy Photograph, now in the collections of the National Archives. Photo #: 80-G-17125 Battle of the Coral Sea, May 1942 View taken from a Torpedo Squadron Five (VT-5) TBD-1 torpedo plane, from USS Yorktown (CV-5) during attacks on the Japanese aircraft carrier Shokaku, during the morning of 8 May 1942. Shokaku is visible in the left center distance. Anti-aircraft shell bursts are also visible. Official U.S. Navy Photograph, now in the collections of the National Archives. 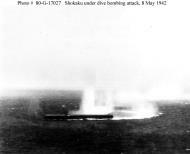 Photo #: 80-G-17422 Battle of Coral Sea, May 1942 Bombs burst near the Japanese aircraft carrier Shokaku as she was attacked by USS Yorktown (CV-5) planes in the morning of 8 May 1942. Note anti-aircraft shell burst in left center, with fragments splashing below and further left. Official U.S. Navy Photograph, now in the collections of the National Archives. 'Japanese Navy Ships — Shokaku (Aircraft Carrier, 1941–1944)'. U.S. Naval Historical Center. 4 June 2000. Retrieved 13 February 2008.